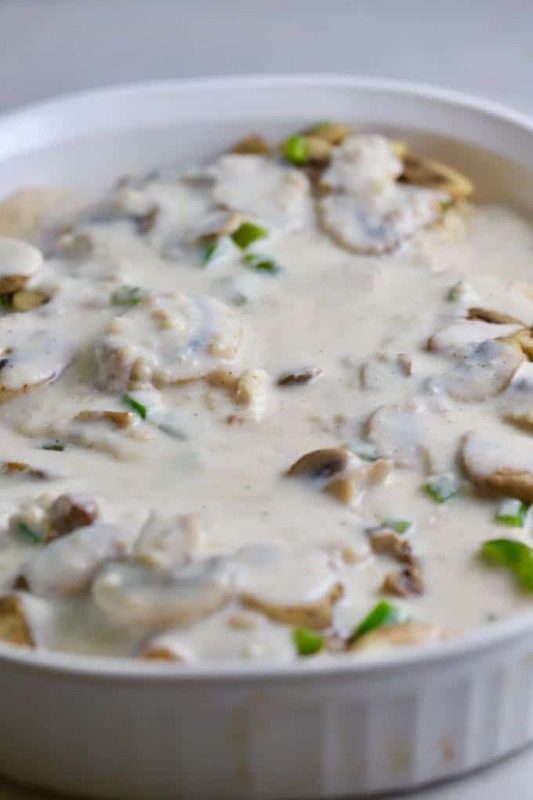 My easy Creamy Oven-Baked Asiago Chicken Breast recipe features juicy, tender oven-baked chicken breasts topped with earthy mushrooms and bell pepper, a creamy, dreamy bechamel sauce, crunchy herb stuffing mix, and rich, nutty, melted asiago cheese. 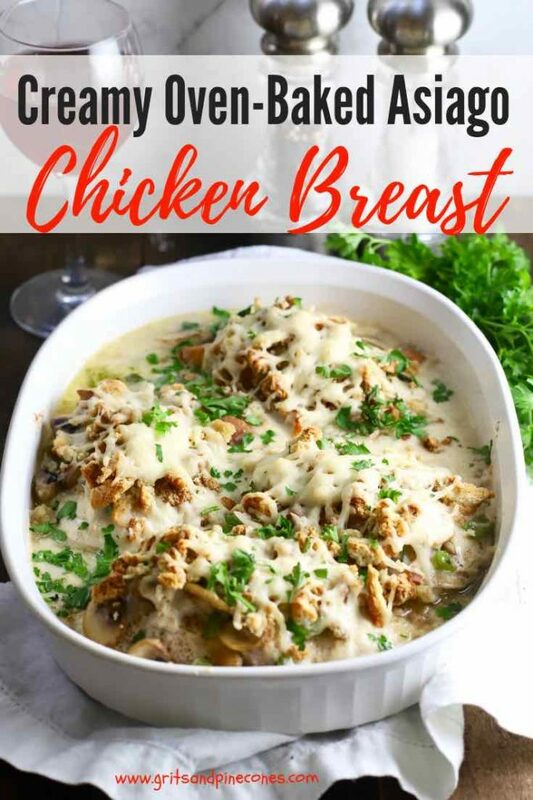 This is the best-baked chicken recipe but, it takes a little more time and has a few more steps than most of my other recipes, so it’s probably not something you want to try for a quick weeknight dinner. But it would be perfect for a Sunday supper or a dinner party with friends. 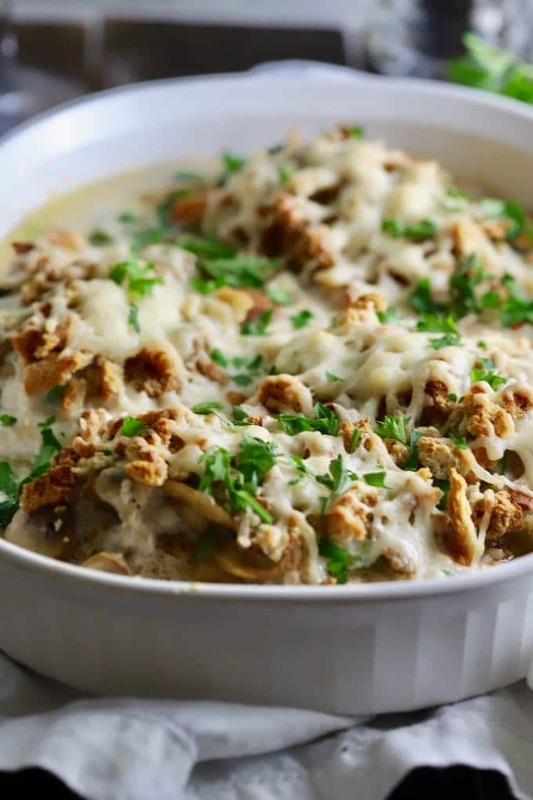 If you are tired of the same old chicken breast recipes and are looking for a new “go-to” recipe, this tasty chicken casserole is for you! 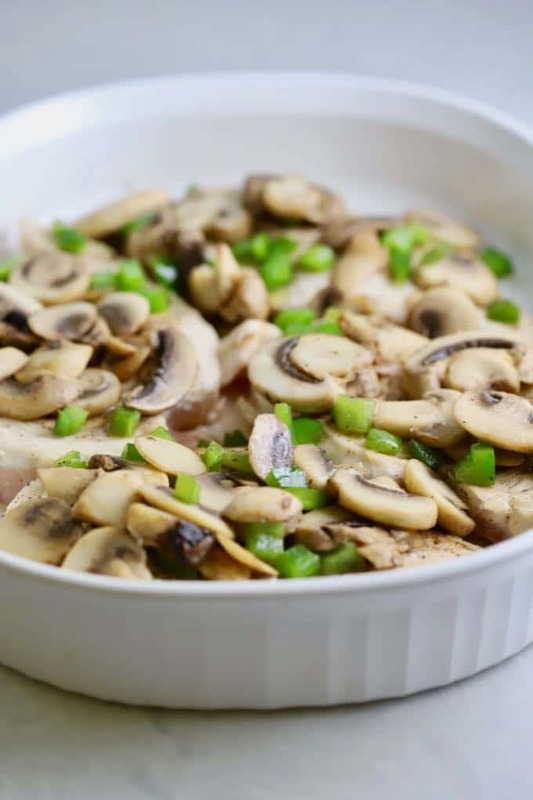 Creamy Oven-Baked Asiago Chicken Breast is a one-dish, veggie-filled, flavorful meal which has it all and only needs a salad to make it a complete dinner! It’s a new favorite of ours and I’m sure it will be a hit at your house too! How to tell when chicken is done? 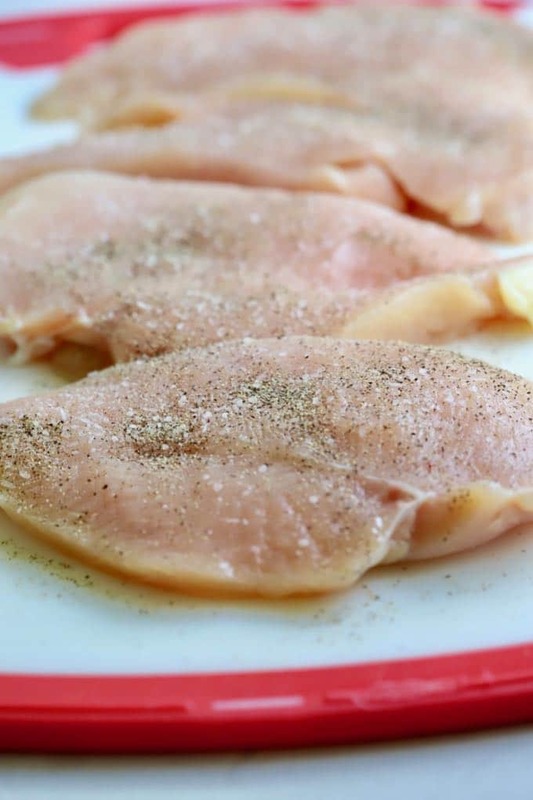 The key to tender juicy chicken breasts is cooking them to 165 degrees F., as measured by a meat thermometer, and not a degree higher. I’m sure you have eaten dried out, tough chicken breasts and it’s because they were overcooked. Chicken thighs are much more forgiving, and if you like dark meat, you can also substitute boneless, skinless chicken thighs for the chicken breasts in this recipe. 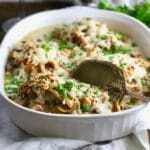 What to serve with Creamy Oven-Baked Asiago Chicken Breasts? 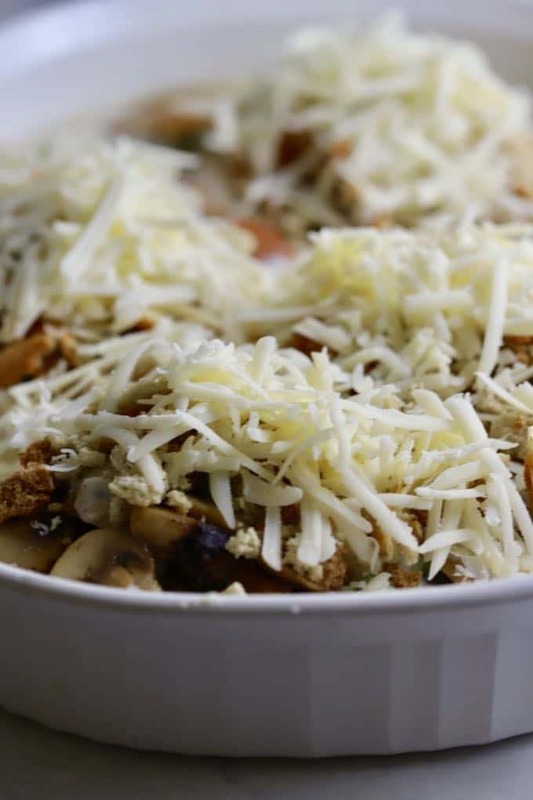 I usually pair this rich, main-dish casserole with just a simple salad. You might want to consider these popular salad recipes on my blog: Southern Cucumber and Tomato Salad, Romaine Wedge Salad with Green Goddess Dressing, or my favorite, Tomato Salad with White Acre Peas! Liberally salt and pepper both sides of the chicken breast. 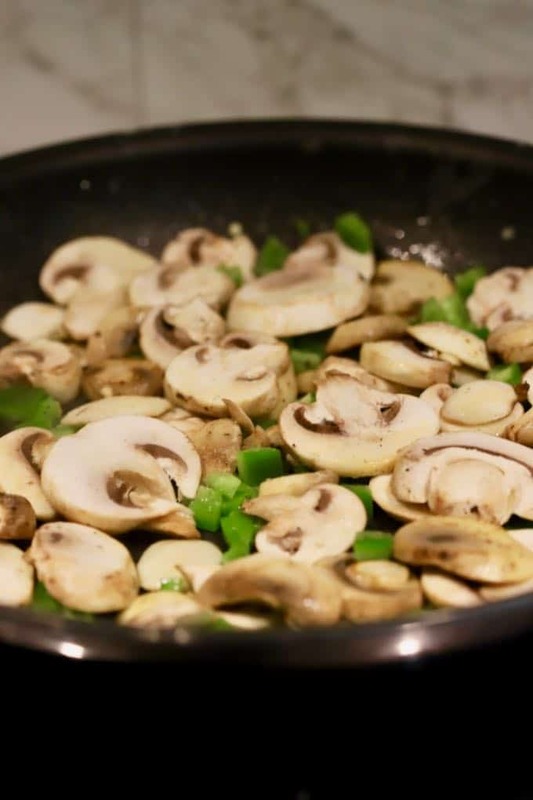 Add the bell pepper and mushrooms to the skillet and saute for about 5 minutes, stirring occasionally until the bell pepper is tender and mushrooms are cooked. Remove from the skillet and set aside. 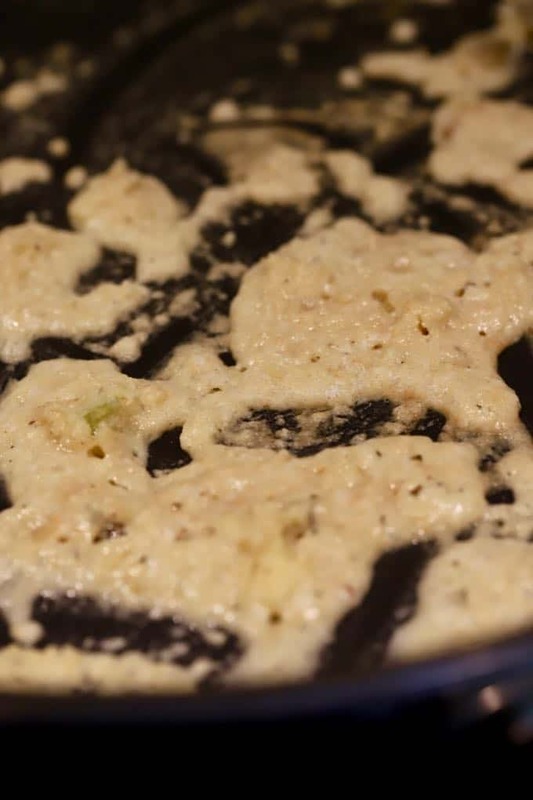 How to make a bechamel sauce. Add 2 tablespoons butter to the skillet and sprinkle in 3 tablespoons of flour. 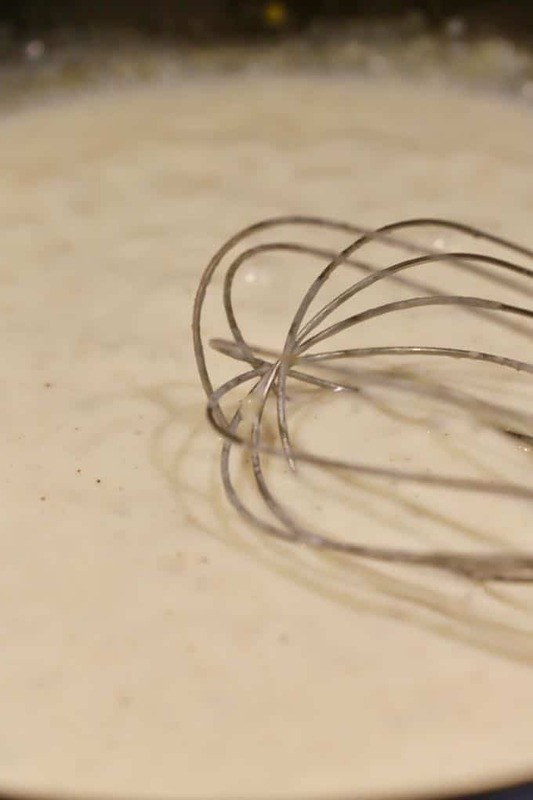 Whisk constantly and cook for 1-2 minutes. Slowly add the milk, whisking constantly until the mixture is smooth without any lumps. Add the sour cream, nutmeg, 1/2 teaspoon of kosher salt, and 1/4 teaspoon of ground black pepper. Cook for an additional 2-3 minutes until the sauce has thickened. 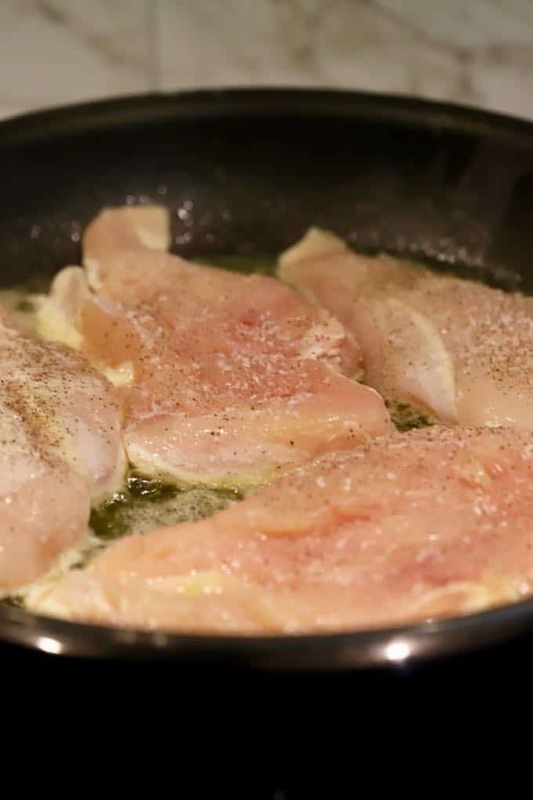 Generously grease a baking dish that will fit the chicken breasts in a single layer and add the chicken breasts. Spoon the mushroom and bell pepper mixture on the top of the chicken. Pour the bechamel sauce over the chicken and top each breast with about 1/4 cup of the dry herb stuffing mix. Finally, spread the shredded asiago cheese evenly over the top of each chicken breast and place in the oven. Remove from the oven, sprinkle with parsley if desired, and serve immediately. This recipe works best if your chicken pieces are all about the same thickness so they will cook in the same amount of time. If your chicken breasts are large, only use two and slice them in half horizontally to equal four pieces of chicken. 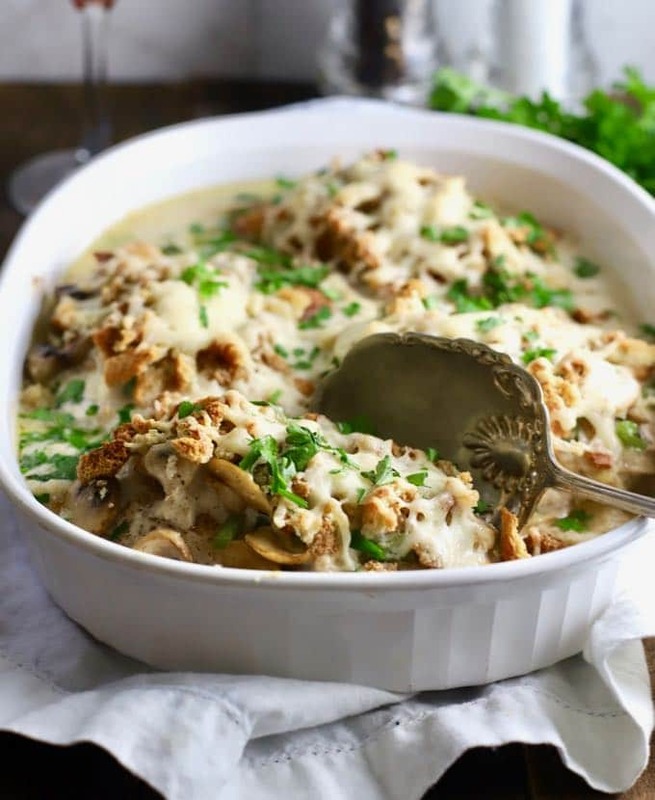 My Creamy Oven-Baked Asiago Chicken Breast recipe features juicy, tender oven-baked chicken breasts topped with earthy mushrooms and bell pepper, a creamy, dreamy bechamel sauce, crunchy herb stuffing mix, and rich, nutty, melted asiago cheese. Pour the sauce over the chicken and top each breast with about 1/4 cup of the dry herb stuffing mix. This sounded so delicious I got all the ingredients to make this sometime during the week. Of course, I was HAD when I saw the use of Asiago cheese, YUM. Anxious to try it. Thank you so much for letting me know your family enjoyed the recipe. I love it when a reader puts their own spin on one of my recipes! Thanks for sharing!